The face value of the coin „5 РУБЛЕЙ” (5 ROUBLES) in two lines in the center of the disc. 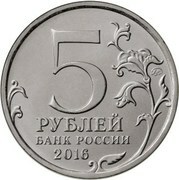 There is an inscription below — „БАНК РОССИИ” (BANK OF RUSSIA) and the year — „2016” under it. On the left and on the right there is a stylized image of a plant branch. In the right part of the disc there is a trademark of a Mint. The relief image of the monument to Minin and Pozharsky in Moscow in the center of the disc. There are inscriptions: „ОСНОВАНО В 1866 г.” (FOUNDED IN 1866) along the circumference on top, „РОССИЙСКОЕ ИСТОРИЧЕСКОЕ ОБЩЕСТВО” (RUSSIAN HISTORICAL SOCIETY) in three lines at the bottom.